Taylor Richardson, a member of the Madison House Alumni Council (MHAC), led and participated in MHAN's volunteer service event in Atlanta. The Atlanta MHAN service event was held in partnership with Open Hand, a meal and nutrition service organization that delivers hundreds of thousands of healthy meals to disabled residents throughout Atlanta every year. "It was a great turnout!" Taylor reports. "Open Hand packages 5,500 meals per day. Our Madison House volunteer group packaged 2,263 of those meals during our service event — that's over 40%! A great accomplishment and we had fun while doing it!" Scroll through the photos below from the Atlanta MHAN event, held in partnership with Open Hand. 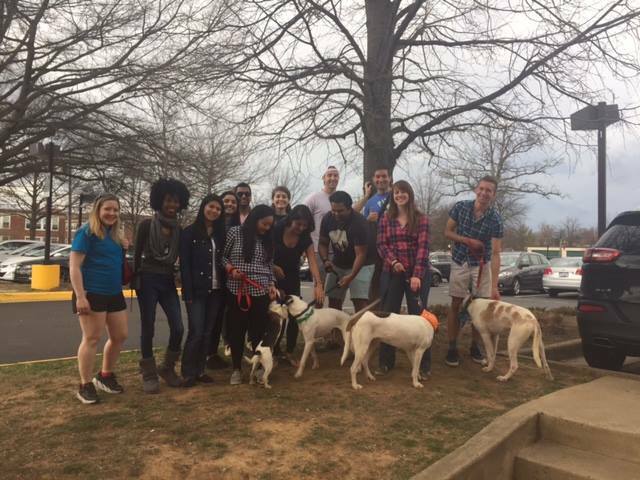 During the Fairfax MHAN event, Madison House alumni partnered with Mutt Love Rescue, a nonprofit, no-kill and volunteer-run dog rescue organization. During an adoption event, Madison House alumni volunteer held leashes and interacted with families interested in adopting one of Mutt Love Rescue's dogs. With MHAN's help, several dogs were successfully adopted! Scroll through the photos below from the Fairfax MHAN event, held in partnership with Mutt Love Rescue.